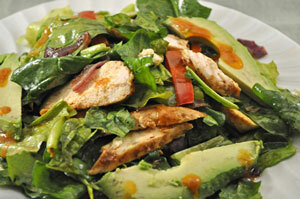 Easy Dinner: Grilled Chicken, Pepper and Avocado Salad, Weekly Menu Plan. What defines summer better than fresh salad and barbecued chicken? Add some avocado and pepper and you have a gorgeous, main dish salad. Add some fresh fruit for dessert. Grilled roasted peppers and onions, chicken with a barbecue flavor and a 'French' dressing for the salad. Try to get a sweet onion: Maui or Walla Walla. Make marinade, pour over chicken and set aside. Clean and slice the pepper into strips. Cut the onion in half and slice thickly. Put onion and pepper into a bowl, add oil and toss well. Cook pepper and onion in grill pan (or any old metal pie or cake tin) on barbecue grill for about 10 minutes until they are crisp-tender. Stir once or twice. When vegetables are done start to cook chicken, 12 - 15 minutes, turning once. Mix ketchup, vinegar and mustard. Slowly add olive oil, whisking constantly. Prepare lettuce and put in large salad bowl. Add a bit (2 tbs) of dressing to lettuce and toss well to coat. Add carrot, peppers and onions, and a bit (1 tbs) more dressing and toss well. Arrange avocado slices around edge of salad. When chicken is done, thinly slice and arrange in center of salad. Drizzle a bit of dressing on the avocado and chicken and serve, remaining dressing on the side. Note: Peppers and onions can be roasted in400F (200C) oven for 20 minutes or sautéed in a skillet until brown. Chicken can be sautéed in a skillet for about the same amount of time. Your choice - nectarines, apricots, watermelon, maybe?